EGI HSU, JV was the prime to design and install steel sheet piling seawall and concrete pile caps along the Santee Basin west seawall adjacent to Sims Road and the Glenn Warner Soccer Facility. Investigate and analyze existing steel sheet pile walls, concrete cap, roadway, and all other structural components required to support roadway. Design and installation of steel sheet piling and make structural connections to the existing tie-back system. Demolish Floating Dock 633E. Investigate, design, and repair road system and soils along Sims Road as affected by the project. 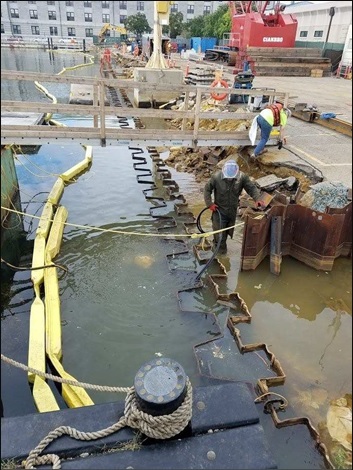 EGI HSU, JV, LLC was awarded the Repairs to Santee Basin project that consisted of design-build construction of steel sheet piling seawall, concrete reinforced seawall and structural modifications to an existing jib crane. The project also included demolition of existing seawall, roadway, abandoned utilities and a floating pier. Repairs were performed on miscellaneous floating piers to extend their service life. HSU performed surface and geotechnical surveys, staking out the area to be demolished and excavated. Underground utilities were identified and protected including sanitary sewer, domestic water, electric and gas. Thorough documentation was created including GPS elevation mapping for future reference. A video survey of the underwater seawall damages was performed to aid in the design development. The video survey also revealed extensive deterioration under the adjoining Pier 225 resulting in an engineering deviation to install a section of reinforced concrete wall on the landside of the Pier 225 seawall interface instead of further undermining of the Pier 225 structure by cutting the pier to install sheet piles on the seaside. A temporary roadway with traffic signals was installed across a sports field prior to closing in the project site which included a portion of Sims Road adjacent to Santee Basin west seawall. The sports field and sidewalks were restored after completion of the project and removal of the temporary roadway. A temporary pedestrian bridge was installed over the water immediately adjacent to the worksite to allow unrestricted access to Pier 225. A temporary roadway with traffic signals was installed across a sports field prior to closing in the project site which included a portion of Sims Road adjacent to Santee Basin west seawall. The sports field and sidewalks were restored after completion of the project and removal of the temporary roadway. A temporary pedestrian bridge was installed over the water immediately adjacent to the worksite to allow unrestricted access to Pier 225. Divers welded steel plates over the holes in the existing seawall to stop further undermining of the landside roadway. The existing roadway and sub-base were removed within 10’ of the existing seawall down to the level of the seawall tie- back system. The concrete pile cap was demolished to expose the tops of the existing sheet piles. 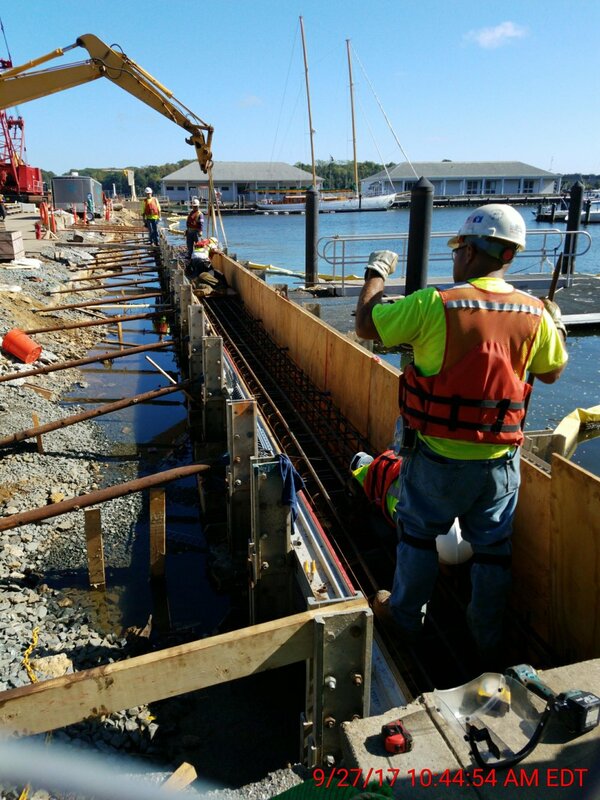 New steel sheet piles were driven immediately outboard—seaside—of the existing sheet piles and new tie-backs attached to the existing tie-back system. A new concrete pile cap encompassing both the new and existing sheet piles was installed. The landside of the Pier 225 interface was excavated to a depth of 12’ below grade—10’ below the mean high-water level—where a reinforced concrete wall structure was installed. Existing utility vaults and junction boxes containing sanitary sewer, domestic water, electric and gas were removed, and the utilities supported in air prior to excavation under the area. A re-designed concrete utility vault and composite junction boxes were installed after the area was backfilled and compacted.